A visual UI test is uniquely identified by the application and test names that you pass to the Eyes SDK open() method. The Apps & tests page allows you to view and manage the list of applications and tests defined by your team, and provides easy access to their baselines and recently run and saved tests. The page is divided into two panels. The left panel displays a list of all the applications tested by your team. When you click an application (e.g., "App_1" below), it becomes the current application, and the test panel in the center of the page displays an application summary and a table with a row of information for each test of that application. Each entry in the application panel has a selection checkbox used for global operations (e.g., delete selected applications). When you hover your cursor over an application entry a menu icon will appear to the right of the name; the menu provides options to delete the specific application or to rename it. The number of tests (test names) associated with the application. The most recent date and time when a test of the application was run. The most recent date and time when a baseline of one of the applications' tests was saved. The name of the person that most recently saved a baseline of one of the applications' tests. The most recent date and time when this test was run with any baseline. The most recent date and time when any of the baselines of this test was saved. The name of the person that most recently saved a baseline of this test. 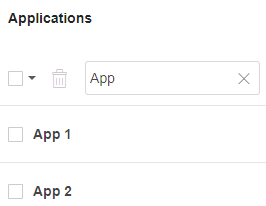 Select the Filter Apps control in the application panel and start typing (e.g., "App" below). As you type, the list of applications will be updated so that only applications whose name contains that string you typed are displayed (the search is case-insensitive). An appears to the right of the text when the filter is active. To see all the applications again, click the or delete the entire string. Below, you can see an example screenshot where the list of applications only lists applications whose name contains the letters "App". You can filter the list of tests by typing some characters in the Filter tests control (e.g., "v1" below). As you type, the list of tests is updated so that it only contains tests whose name contain the string in the search field. To remove the filter and see all of the tests, click on the , or delete all the characters in the text box. Below you can see an example where the list of tests contains only tests whose name contain the string "v1".